What do the Chicago Blackhawks, Washington Redskins, and Cleveland Indians have in common? Sport and its continued appropriation of Indigenous culture. 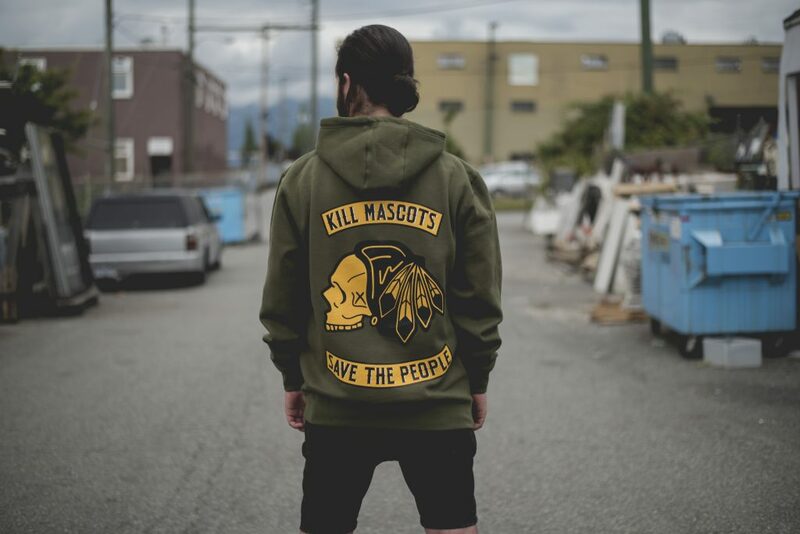 Section 35, a B.C.-based apparel company, is pushing back. Founded by friends Justin Louis and Andrew Kazakoff, Section 35 tackles Indigenous stereotypes head-on with political statements people can wear. “You can still create conversation with clothing, but in a way that people can enjoy wearing it,” says Louis, who is from the Samson Cree Nation in Alberta and is currently based in the Coast Salish Territory of Vancouver. While the designs themselves are conversation starters, so is the company’s name. “Section 35” alludes to the section in the Constitution Act of 1982 that protects Aboriginal treaty rights to land, fish, log, and hunt. The company carries everything from leggings designed with portraits of Indigenous matriarchs to ball caps resembling the Red Sox logo replaced with red moccasins. Their most popular collection called “Kill Mascots, Save the People,” created in collaboration with Chicago-based artist Santiago X, brings awareness to Indigenous imagery that’s misrepresented and misused on sports teams’ jerseys. Starting a clothing line was the last thing the two friends thought would happen when they first met playing baseball. As a descendant of Russian immigrants, Kazakoff believed in the message of inclusion that Louis hoped to spread. Their message has since infiltrated pop culture, with members from A Tribe Called Red and Major Lazer sporting their designs.